As a longtime fan of David Moss, I needed only to learn of his involvement in Surrogate Cities before rushing out to buy the CD. Sadly, at the time I had no idea who Heiner Goebbels was. I couldn’t have asked for a more comprehensive introduction. 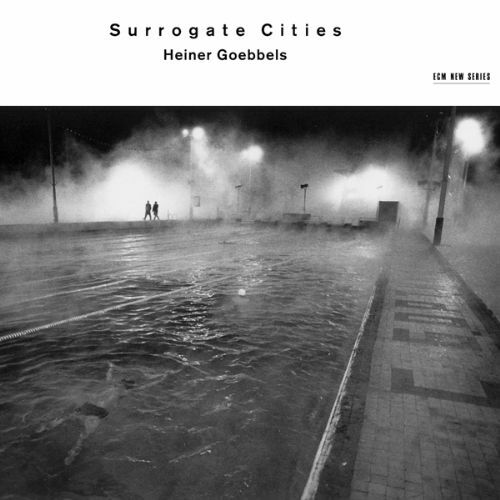 The reader will forgive my penchant for abstract analogies when I say that Surrogate Cities is like pricking a piece of paper with a pin and shining a metropolitan nightscape through it so that one may connect those rays of light with brittle chalk. Practically speaking, the project is meant to be an ode to the city of Frankfurt in celebration of its 1200th year. As such, it is an amalgam of atmospheres, moods, and sensual provocations. This project unfolds like a massive suite with instruments drawn from architecture and flesh alike. Each section reads like a novella in the grander scheme of its binding. Preluded by snippets of cantorial singing, computer-controlled voices seek dominance over the imperialistic power of the orchestra in a kaleidoscopic and utterly focused vision of the urban sprawl. Rather than penetrating the city, Goebbels turns it inside out for our inspection. The samples are not so much quotations as they are memories shaken loose from long-neglected nooks and crannies. The digital flick of “Menuett/L’ingénieur” is haunting in its subtlety, appropriated like so much data flowing through the airwaves. The conclusion, “Air/Compression,” is a chamber piece for the overlooked sounds of our post-industrial comfort. Admirers of John Zorn’s Kristallnacht will find themselves on familiar ground here, as the archival instinct is similarly apparent. Based on words by Heiner Müller, this song cycle relates a conflict between Rome and neighboring Alba. A lot is cast to determine who will fight as representative of each city. A Horatian is chosen for Rome, a Curiation for Alba. During the course of the ensuing battle, the Horatian strikes down the Curiation and does not spare his life. His sister, who is betrothed to the Curiation, weeps upon his return. He rewards her grief by slaying her. Thus is the victor’s valiant heart tainted with murder. According to Müller, Goebbels “proposes a new form of reading, a different, no longer touristic approach to the landscape of a text.” In this sense, The Horatian is far from the bombastic cantata it could have been. Rather, it heaves with the weight of its own moral conundrum. Joselyn B. Smith is superb as the voice of bipartisanship, weaving in and out of its allegiances with the acuity of a practiced raconteuse. She emotes with a confident Broadway twang that is gorgeously appealing against Goebbels’s orchestral backdrop. D & C sounds like someone knocking at the outside of a building with no entrance; a book one has been dying to read, but which opens to reveal rain-soaked pages. It is a film noir standing on its head, loose change and candy wrappers falling out of its pockets. The music circles until it loses hope and collapses onto the wet asphalt. Surrogate, with words by Hugo Hamilton, is the moment I was waiting for during my first listen. Over a lush carpet of piano, Moss runs into the night along with the nameless character of Hamilton’s text. His indulgent enunciation of “surrogate” is priceless, prelude to a tranquil, breathy fade. The words here are by Paul Auster. Bleak and morose, they paint a fatalistic picture of urban living. Moss provides the narration here as Smith wails plaintively in the background: “A house is there one day, and the next day it is gone. A street you walked down yesterday is no longer there today…” The city has become the ephemeral soldier, running AWOL from the army of its own becoming. All convictions remain unrequited, leaving the barest puffs of cigarette smoke as the only indications that they ever breathed. Smith and Moss are the clear winners here. Not to be outdone, however, is the superb orchestra. The presentation is sharp, the sound so crisp you want to teethe on it, and the arrangements fantastically varied. Probably not the best album to play in your greenhouse, but for our psychological biota it does the trick.